It features a rectangle shape. This vessel is designed to be installed as a above counter vessel. It is constructed with ceramic. This vessel comes with a enamel glaze finish in White color. It is designed for a wall mount faucet. Simple and clean above counter rectangular white ceramic vessel. Featuring an overflow. Completely finished from all sides including back. Premium white glaze for a glossy finish. Kiln dried ceramic construction. Smooth non-porous surface prevents from discoloration and fading. Can be used with a wall mount faucet installation. Double fired and glazed for durability and stain resistance. Quality control approved in Canada. Re-inspected prior to shipping your order. Faucet and accessories not included. 1.75-in. standard US drain opening. Recommended drain for this sink is 871211017954.. It features a rectangle shape it is designed to be installed as an undermount sink. It is constructed with ceramic. This undermount sink comes with a enamel glaze finish in White color. This transitional undermount sink product is CUPC certified. It features a rectangle shape and it is designed to be installed as an undermount sink. It is constructed with ceramic. This undermount sink comes with a enamel glaze finish in White color. 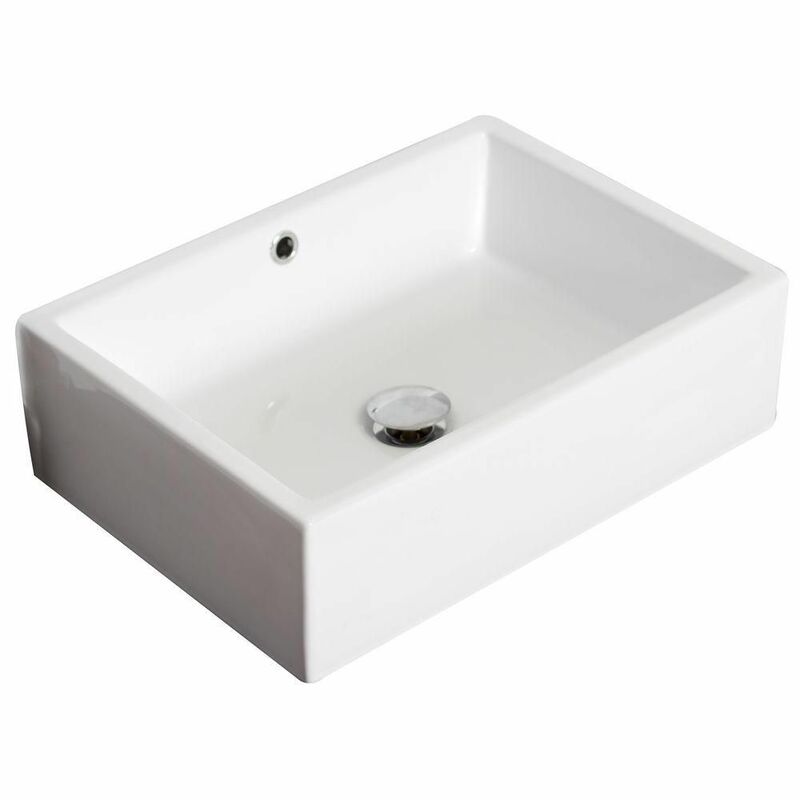 20-inch W x 14-inch D Rectangular Vessel Sink in White It features a rectangle shape. This vessel is designed to be installed as a above counter vessel. It is constructed with ceramic. This vessel comes with a enamel glaze finish in White color. It is designed for a wall mount faucet. 20-inch W x 14-inch D Rectangular Vessel Sink in White is rated 5.0 out of 5 by 1. Rated 5 out of 5 by Happylady from Looks great!! Shipping was super fast and we love it . Great size and just the right depth to make it very functional! !